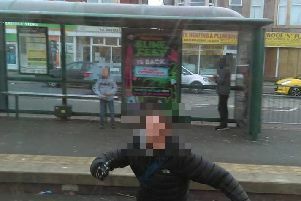 Last Friday youths were accused of "deliberately" blocking the tram tracks in Cleveleys. A spokesman for Heritage Tram Tours, which runs historic trams along the Fylde coast for enthusiasts, told police in the town there had been "problems" with "youths deliberately blocking the tramway" at Thornton Gate. Police were forced to put into place a dispersal order from 5pm on Friday until the same time on Sunday, which gave officers the ability to force people to leave the area. This latest anti-social behaviour came only a day after police were made aware of several vile graffiti drawings on the seawall in Cleveleys. This seems to be going on a while wonder what the out come should be in places likes Singapore. Kuwait.to soft this country. Keep rolling, they either move or get flattened, simple as that! Was on the last trip from Fleetwood yesterday on the open boat did see some youths messing around near Aldi jumping around on the tracks. We just want to enjoy our heritage trams not have youths spoiling it for us. Bring back the police thick ear! We are to soft with kids of today they need discipline, my two know right from wrong. Where are the parents?.maybe if they were made to pay a fine for their unruly kids something might get done! This thing is annoying as nothing ever gets done, the police are sitting on their hand, the courts can’t do anything useful. Government need to tackle this problem that has creeped in over the years. Borstal, national service, cane at schools , thick ears handed out from parents etc. But that’s not going to happen. They are probably enjoying the notoriety.